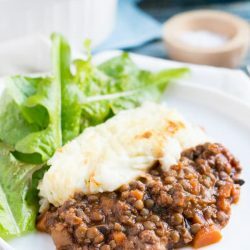 I use small green French (Puy) lentils in this recipe. Use small, whole lentils rather than the large brown lentils or hulled red lentils. Small whole red lentils or black beluga lentils would also be suitable. Soak the lentils overnight in a large bowl of water if you remember. This is not a necessary step, but will help the lentils cook faster. I usually divide this mixture into two 2L dishes, then cook one for dinner and freeze the other pie. A 2L container is slightly larger than you will need, but it stops the pie filling overflowing onto my oven floor. 1 kg potatoes peeled and roughly chopped. If the lentils have been soaked overnight, rinse and drain them. Place the lentils in a medium saucepan, add the bay leaf, and cover the lentils with cold water. Bring the lentils to the boil, then reduce the heat and simmer for 12 minutes (soaked) to 20 minutes (unsoaked), or until the lentils are just soft enough to be crushed between your fingers. Drain the lentils, retain the bay leaf, and set aside. Add the oil and onions to a large fry pan with a lid (or a large dutch oven) over a medium heat , and saute the onions for 10 minutes, or until softened and browned. Add the carrots and saute for a further 3 minutes. Add the mushrooms, and saute for a further 3 minutes, or until the mushrooms have softened. Stir in the garlic and the chopped rosemary, and saute for a further minute. Stir the lamb mince into the vegetables, and cooking for a further 3 minutes, or until the meat is lightly browned. Sprinkle the flour over the meat and vegetable mixture, stir through, and cook for a further minute. It may be necessary to scrape the bottom of the pan if the meat starts to stick. Gently pour in the stock, stirring it through the meat and vegetables, and simmer gently until the mixture slightly thickens. Add the remainder of the ingredients, including the drained lentils and the reserved bay leaf. Season with salt & pepper, and bring the mixture to the boil. Reduce the heat to low, cover and simmer for 45 minutes, stirring occasionally. If the mixture thickens too much, stir in a little water. Whilst the filling is cooking, boil or steam the potatoes until quite soft. I prefer to steam my potatoes using a steaming basket in a large saucepan. Drain the potatoes, and allow them to sit without a lid for two minutes to allow them to dry slightly. Add the butter and milk to the saucepan, and season with salt and pepper. Mash the potatoes together with the butter and milk. If the mixture seems too stiff, add a little more milk. You are aiming for a smooth mash that can be spread across the top of the pie. Remove the thyme sprigs from the meat mixture. Discard. Spoon the filling into the bottom of the casseroles dish(es). Top the filling with the mashed potato. Smooth the top with the back of a spoon. At this point I like to rough up the top of the mash with a fork, which will brown in the heat of the oven. If serving immediately, cook the pie at 200C (180C fan forced) for about 20 - 25 minutes, or until the top has browned and the filling is bubbling up the side. Serve with a simple salad or steamed vegetables. * The pie can be cooked from frozen, however I prefer to defrost it first. If cooking from frozen, I would add at least an extra 20 minutes to the cooking time. ^ The pie will be gluten free if you use a gluten free plain flour.